Mike Karikas has some special moves. Hey! As you certainly know September 19 was International Talk Like A Pirate Day, my favorite and most celebrated holiday of all. 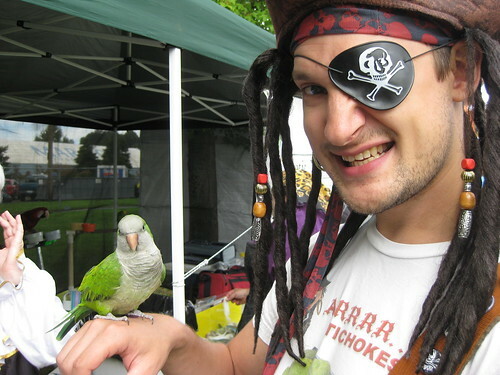 I spent the day w/ Alice at the Portland Pirate Festival and let me tell ya, me hearty, it was a swashbucklin' time! Got a whole gallery up over hearrrrrrre: Portland Pirate Festival 2009 photo set. But what I'm really excited about today... the last few movies I've seen have all been "kids" movies, but they've all been some of the best movies I've seen in a long time. So enjoyable by the adult crowd... I'm very happy. In fact, we saw Cloudy With A Chance of Meatballs tonight in IMAX 3D and it's got to be one of the most enjoyable movies I've ever seen. I nearly fell out of my chair, I was laughing so hard!! It matched my sense of humor to a perfect tee. Up and Ponyo are also amazing, fantastic movies, just one notch below those. You should also check out our latest Neutrino web site, LRG Boston - it's pretty rad. Back to wedding planning for me, so long!